Israel on Friday praised a new Trump administration strategy that seeks to combat the hostility and hypocrisy of members of the United Nations Security Council. The strategy was unveiled Friday when U.S. Ambassador to the United Nations Nikki Haley vetoed a resolution sponsored by Kuwait seeking to condemn Israel for the "excessive, disproportionate and indiscriminate" use of force "against Palestinian civilians," according to The Jerusalem Post. Kuwait introduced the resolution in response to weeks of rioting and violence along the border between Israel and Palestinian-controlled Gaza. The violence erupted towards the end of March when thousands of demonstrators swarmed the border for what organizers call the "March of Return." The demonstrators, demanding that Palestinian refugees and their descendants be allowed to return to what is now Israel, have attacked Israeli soldiers in an effort to breach the border. The violence has resulted in approximately 120 Palestinians being killed and hundreds wounded. The Kuwait resolution made no mention of Hamas, the terrorist group governing the Gaza Strip, and the role it has played in encouraging Palestinian demonstrators to assail Israel Defense Forces with incendiary kites and Molotov cocktails. Instead, the resolution laid the sole blame for the violence at the feet of Israel, ignoring accounts, from both Israel and Hamas, indicating a large portion of the demonstrators killed were affiliated with terrorist organizations. The resolution, which garnered the support of 10 of the 15 Security Council members, would also have granted "international protection" for Palestinians in Gaza and insisted Israel cease its actions in self-defense. Haley moved to defeat the measure by exercising the U.S.'s veto authority as a permanent member of the Security Council. In order for a resolution to secure passage, a minimum of nine favorable votes are required with none of the council's five permanent members–the United Kingdom, France, Russia, China, and the United States–issuing a veto. The U.S. ambassador then forced the Security Council to consider a measure condemning Hamas as a terrorist organization. The U.S. resolution specifically cited the recent firing of over 70 rockets by Hamas into Israeli territory, the largest artillery barrage from Gaza since 2014. The resolution mirrored language the Trump White House took in May when it asserted Hamas bore sole responsibility for the violence and deaths that have ensued. Israel's permanent representative to the U.N., Danny Danon, praised the Trump administration's move, stating it reversed the course Israel had long faced in the Security Council. "This is changing the rules of the game – we are now on the offense," Danon told the Post. "It’s the beginning of a new strategy and of new rules." "From now on, whenever there’s going to be a resolution like this condemning Israel, it won’t be just a US veto that follows," Danon said. "There will be a proactive effort to expose the hypocrisy of the council." Although the resolution failed overwhelmingly, only garnering one vote in favor–coming from Haley–its purpose was to call out the hypocrisy of U.N. members that attempted to hold Israel and Hamas to different standards. In a statement released shortly after the vote, Haley castigated members of the Security Council for being "unwilling" to call Hamas to account for the violence perpetrated in the Gaza Strip. "With its votes today, the UN Security Council majority showed that it was willing to blame Israel, but unwilling to blame Hamas, for violence in Gaza," Haley said. "Further proof was not needed, but it is now completely clear that the UN is hopelessly biased against Israel." 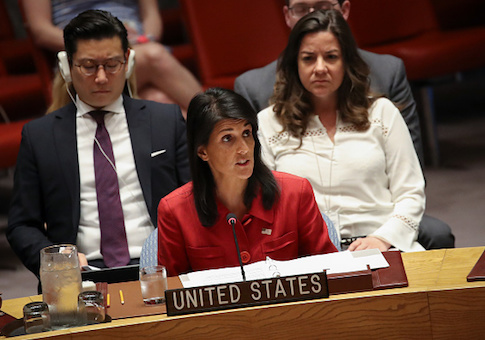 The U.S. ambassador expressed that the United States was committed to ensuring Israel received impartial treatment at the U.N. and would not hesitate to exercise its veto power if needed. "The United States will not allow such bias, which is why we did not hesitate to cast our veto," Haley stated. This entry was posted in National Security and tagged Gaza, Hamas, Israel, Nikki Haley, Trump Administration, United Nations. Bookmark the permalink.